Oscar Wilde (1854-1900) was a playwright, poet, novelist, story-writer, journalist, essayist, epigrammist, father, husband, and convicted homosexual. He was a daunting wit, a committed aesthete, and remains a lasting icon. Oscar Fingal O'Flahterie Wilde was born in Dublin on 16 October, 1854, the second of three children. His father, Sir William Wilde, was Ireland's best oto-optamologic, knighted for medical services, and collector and publisher of Irish folklore. His mother, Jane Francesca Wilde, was an Irish nationalist, a poet who published under the pseudonym 'Speranza', and the centre of a literary salon. In February 1867 Oscar's little sister Isola died, and he carried a lock of her hair thereafter. By the time he finished school in 1871, Wilde had won a scholarship to Trinity College, Dublin, where he studied classics with John Pentland Mahaffy and Robert Yelverton Turrell. Mahaffy, whom Wilde called his "first and best teacher", would later inspire Wilde's character Prince Paul Maraloffski in Vera. In his final year Wilde won Trinity College's highest academic award in Greek, the Berkeley Gold Medal, and received a demyship to study Greats and Classics at Magdalen College, Oxford. Wilde studied at Oxford from 1874 to 1879 (and received a double first). There Walter Horatio Pater and John Ruskin inducted Wilde into the culture of aesthetes, of which Wilde became a life-long proponent. He wore his hair long and decorated his room with flowers and feathers. He famously said of the blue china with which he entertained, "I find it harder and harder every day to live up to my blue china". On 19 April 1876, Wilde’s father died. Two years later, in 1878, Wilde won Oxford's Newdigate prize for his poem 'Ravenna'. For some time he was unable to graduate because of his deliberately and repeatedly failing Oxford’s mandatory divinity test. Once he did graduate, Wilde returned to Dublin and tried to romance his childhood sweetheart, Florence Balcombe, who instead married Bram Stoker. In 1879 Wilde moved to London, followed by his mother and brother. In 1881 he self-published a book, Poems, which sold out of its first print run within the year. "The difference between literature and journalism is that journalism is unreadable and literature is not read"
Wilde quickly became a staple of London society with his clever sayings and aesthetic flair. He befriended famous actresses such as Lillie Langtry, Ellen Terry, and Sarah Bernhardt, and in 1881 the Gilbert and Sullivan operetta Patience satirised Wilde and his aesthetic movement as the character 'Bunthorne'. His first play was Vera, but the 1881 London premier was cancelled due to fears that his depiction of a tsar might reflect poorly on the recent assassination of Tsar Alexander II. Richard D'Oyly Carte, producer of Patience, hired Wilde to lecture across the United States in advance of the production's US premier, so that Americans would understand the aesthetic movement the operetta mocked. Wilde delivered nearly 150 lectures in North America over the next year. In 1883 he moved to Paris, where he met Robert Sherard, his friend and later biographer. On 29 May 1884, Wilde married fellow Dubliner Constance Mary Lloyd. They had two sons: Cyril, born in 1885, and Vivian, born in 1886. Money was tight, especially since Wilde's work was mostly freelance and he was helping to support his mother. In 1885 a letter to the Pall Mall Gazette led to a regular job as a reviewer and journalist, and in 1887 he became the editor of The Lady's World magazine. He quickly re-named the publication The Woman's World and raised its tone. In 1891 he left the magazine. In 1888 Wilde published his first collection of fairy tales, The Happy Prince and Other Tales, and in 1891 he published Lord Arthur Savile's Crime and Other Stories and A House of the Pomegranates. He continued to write and print aesthetic dialogues, social satires, and even one political essay, The Soul of Man Under Socialism. "There is no such thing as a moral or immoral book. Books are either well written or badly written. That is all"
In July 1880 The Picture of Dorian Gray was published in Lippincott's Monthly Magazine. Critics decried the Faustian tale as homosexual, poisonous, and deserving of being burnt, and so of course it was a tremendous popular success. W. H. Smith refused to stock the novel. His play Salomé was published in Paris and London, but was forbidden performance by the lord chamberlain because of legislation banning religious plays. Wilde's play Lady Windemere's Fan, first performed on 20 February 1892 at the St. James’ Theatre, took England by storm. In 1893 Wilde met Robert Ross, allegedly the man who introduced him to homosexuality. In the same year, Wilde wrote A Woman of No Importance, and in 1894, An Ideal Husband and his most famous play, The Importance of Being Earnest. Oscar Wilde became the most popular playwright of his time. His wit, realism, rich characters, and social and political critique made for lasting and wonderful plays. "'The Love that dare not speak its name' in this century is such great affection of an elder for a younger man as there was between David and Jonathan, such as Plato made the very basis of his philosophy, and such as you find in the sonnets of Michaelangelo and Shakespeare. It is that deep, spiritual affection that is as pure as it is perfect"
In 1891 a friend introduced Oscar Wilde to Alfred Douglas, Oxford student and son of John Sholto Douglas, ninth marquess of Queensberry. Wilde became devoted to Alfred, known to his friends as 'Bosie', and overlooked Douglas' reckless public displays of homosexuality, then still outlawed. Douglas introduced Wilde to the world of gay prostitution. 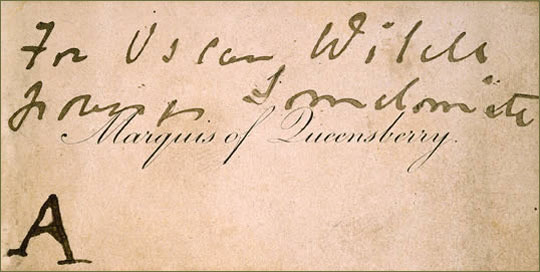 On 28 February 1895 an enraged Queensberry delivered Wilde his card on which was written, "To Oscar Wilde, posing as a sodomite". Wilde accused him of libel, and in the resulting trial, Wilde v Queensberry, Queensberry defended himself by bringing forth evidence of Wilde's dealings with male prostitutes, transvestites, and homosexual brothels. The April trial attracted the public eye, with Wilde witty as ever but legally inept on the stand. Wilde dropped his case, which required him to pay Lord Queensberry's legal fees, rendering the Wilde family bankrupt. As a result of the evidence that emerged in Wilde v Queensberry, on 5 April 1895 Wilde was arrested under the Criminal Law Amendment Act. He was tried for gross indecency in Regina v Wilde. During the trial his letters and poems to Douglas were presented as evidence, and Wilde eloquently defended what he termed "The love that dare not speak its name". In the trial Wilde was presented as a corrupter of young men. On 25 May 1895 Justice Wills condemned Wilde to the maximum possible sentence, two years' hard labour. The Wilde family was shunned, and the family's Tite Street home seized to pay legal fees. Constance took the children to stay with her brother in Switzerland, and while she did not divorce Wilde, she and her children took her maiden name. The bulk of Wilde's time in prison was spent in Reading gaol, where he underwent physical and psychological degradation. During his time in prison Wilde wrote De Profundis, a letter chronicling his life, his relationship with Douglas (speaking quite damningly of the young lord), and the solace he found in religion. He also wrote The Ballad of Reading Gaol, which protested poor treatment of English prisoners. Wilde was released on 18 May 1898, but his health did not recover. He left for the continent, never to return to England. He stayed in Naples, where he briefly reconciled with Douglas, but died penniless in Paris on 30 November 1900. Robert Ross paid for his body to be moved to Père Lachaise cemetery in Paris, and commissioned a monument by Jacob Epstein. When Ross died, his ashes were placed in Wilde's grave. "The only thing worse than being talked about is not being talked about"
One of the most fascinating things about Wilde is that quite apart from being idolised for his wit and writings, he has been seized posthumously as a political symbol. Wilde was the most famous victim of the criminalization of homosexuality, and as such his plays took on a political tenor in the mid-twentieth century. Wilde spawned a myriad of biographies, poems by A. E. Housman, and plays by Tom Stoppard and David Hare. Homosexual and bi-sexual actors like John Gielgud and Michael Redgrave made a point to seek roles in Wilde's plays. In the late 1940s and early 1950s, sales of his books soared during the legal battle leading up to the Sexual Offences Act 1967, when Parliament finally decriminalised homosexuality. Marks of adoration – especially lipstick kiss-marks – were placed on his grave in Paris so often that his monument is now surrounded by glass. Wilde became not just a famous wit or even an aesthetic icon, but also a martyr of sorts. The public fascination with Oscar Wilde shows no sign of abating. And if you don’t know why, you had best go read his works right away. Cite:The Importance of Being Wilde by Kate O'Connor at http://writersinspire.org/content/importance-being-wilde. Accessed on Wednesday, April 24, 2019. If reusing this resource please attribute as follows: The Importance of Being Wilde at http://writersinspire.org/content/importance-being-wilde by Kate O'Connor, licensed as Creative Commons BY-NC-SA (2.0 UK).